On 24 September, join the UN Global Compact Leaders Summit 2018 to share achievements and discuss the challenges and opportunities business face in delivering the Sustainable Development Goals (SDGs). Looking for practical guidance that can enable your company to better measure and report on your impact on the Global Goals? Check out UN Global Compact and GRI new practical guide to SDG Reporting. Almost three years in to the 2030 Agenda, Lise Kingo reflects on the important progress that has been made, particularly when it comes to raising awareness of the Sustainable Development Goals (SDGs) and mobilizing action. "But at the global scale, progress on the SDGs is happening far too slowly. In far too many areas — such as climate, conflict and inequality — we are moving alarmingly backwards, putting the international community at serious risk of failing to deliver on the SDGs by their 2030 deadline," writes Lise Kingo. The UN Global Compact — together with its partners — reached a significant milestone in closing two three-year long projects to advance anti-corruption Collective Action. Under the Siemens Integrity Initiative Second Funding Round, the two projects brought together businesses, Governments and civil society with the aim of leveling the playing field and raising compliance standards across Brazil, Egypt, Japan, Kenya and Nigeria. Both projects were anchored in the Tenth Principle of the UN Global Compact as well as Goal 16, specifically target 16.5, of the Sustainable Development Goals, and reinforce a call to Governments and businesses everywhere to work against corruption in all its forms. GRI and the UN Global Compact publish a "Practical Guide" to embed the Sustainable Development Goals (SDGs) into corporate reporting — helping companies of all sizes to prioritize SDG targets, to act and report on, set related business objectives, and measure and report on progress. At the SDG Country Plans: A Roadmap to Private Investment — organized on the sidelines of the High-level Political Forum (HLPF) — Governments, business and investors join Global Compact Local Networks to discuss creative approaches that are being jointly developed at the national level by multi-stakeholder partners and share best practices to deliver the 2030 Agenda. In her keynote address at the SDG Business Forum 2018, H.E Amina J. Mohammed, Deputy Secretary-General of the United Nations, encouraged businesses everywhere to commit to sustainable development, “as a fundamental first step on their sustainability journeys, we need companies to ensure they are doing business responsibly, in alignment with UN values and the Ten Principles of the UN Global Compact." Co-hosted by the International Chamber of Commerce (ICC), the United Nations Department of Economic and Social Affairs (UN DESA) and the UN Global Compact, the 2018 SDG Business Forum convened a diverse and multi-stakeholder group reaching nearly 600 participants. Enthusiasm, renewed energy and a positive approach was top of mind as leaders from business, Governments, civil society and the United Nations met at the third annual Forum to set a new direction to meet the Sustainable Development Goals by 2030. Ten recommendations intended to stimulate more investment in sustainable business solutions to help advance the Sustainable Development Goals (SDGs) were published at the SDG Business Forum 2018 by the Global Reporting Initiative (GRI), Principles for Responsible Investment (PRI) and the United Nations Global Compact. The recommendations focus on how corporate reporting on the SDGs can best address investors’ information needs to help mobilize sustainable finance needed for the achievement of the SDGs. The Cities Partnerships Challenge aims to bring together committed partners across public and private sectors to help cities address complex challenges through integrated solutions that will accelerate implementation of the SDGs. So far, we have received Expressions of Interest from 67 city and non-city applicants. Cities, towns and regional governments, register your interest in the Cities Partnerships Challenge by 5 October 2018. Launched in 2014, the Call to Action was put forth as an appeal by the private sector to Governments to promote anti-corruption measures and to implement policies that will establish systems of good governance. Today, over 250 companies and investors worldwide have signed on to the Anti-Corruption Call to Action. On the ground, companies face unique challenges to operating responsibly and have different opportunities to make a positive impact. Our nearly 70 Local Networks advance corporate sustainability at the grassroots level by helping companies understand what responsible business means within a national context. We are at a key moment in the evolution of sustainability — transparency is fast becoming the new paradigm for conducting business. Join the UN Global Compact Reporting on the SDGs Action Platform to engage in a corporate learning programme to identify solutions and innovative ways to report on your Global Goals progress. A new digital experience is coming to the UN Global Compact Academy — the premier learning platform for sustainable companies. 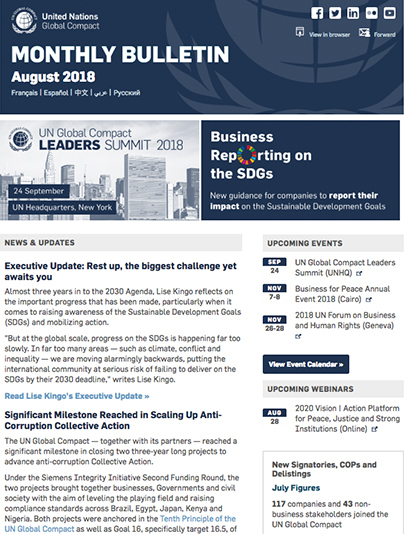 Exclusively available to companies engaging with the UN Global Compact at the Participant tier, the new website and learning platform will give you access to expert-led sessions, practical e-learning guides and tools, knowledge-sharing workshops and a global community of sustainability leaders. Helps businesses to learn more about Global Compact's Collection Action Project in partnership with five Global Compact Local Networks in Brazil, Japan, Kenya, Nigeria and Egypt, improve anti-corruption practices within their individual organizations and to engage other businesses, Governments and civil society in anti-corruption Collective Action. Features recommendations on how corporate reporting on the Sustainable Development Goals (SDGs) can best address investors’ information needs. By helping inform investors' decision-making process, corporate SDG reporting can stimulate more investment in sustainable business solutions to help advance the Global Goals. Serves to demonstrate how Global Compact Local Networks can help accelerate action and collaboration to close the gaps between where we currently are and where we need to be by 2030. This report contains examples from more than 30 Local Networks around the world driving business engagement on the Sustainable Development Goals through five primary activities. Seeks to provide an in-depth review and includes data on the global baseline status of SDG 6, the current situation and trends at global and regional levels, and what more needs to be done to achieve this goal by 2030. The report is based on the latest data available for the 11 SDG 6 global indicators1 selected by Member States to track progress towards the eight global targets, plus complementary data and evidence from a wide range of sources.